Terry Bontemps “$40,000 Profit In One Hour” Note Buying App is the best real estate investing software for flipping houses from your iPhone in the world! 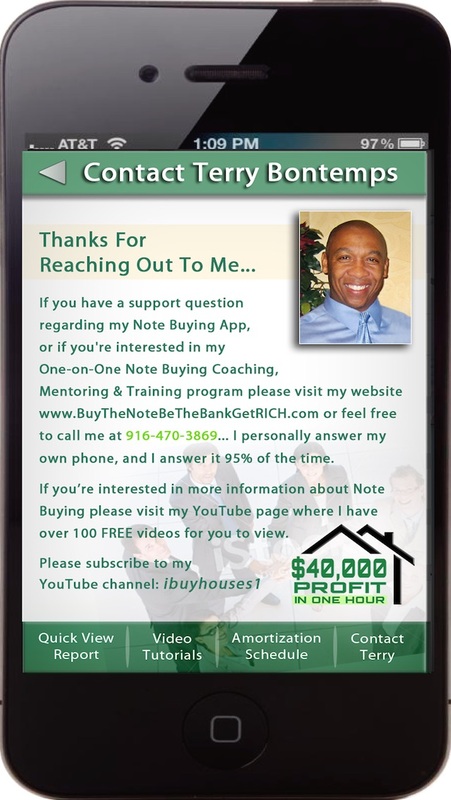 Terry Bontemps “$40,000 Profit In One Hour” Note Buying App is a real estate investment analysis calculator for finding, funding & flipping NPN's (Nonperforming Notes)! Note Buying App takes the guesswork out of the decision making process so that you focus only on what matters most when it comes to investing in real estate & that is the financial numbers, your risk versus reward ratio & how much profit you'll make on your note deal! Note Buying App makes it easy to evaluate the profit potential of any 1st or 2nd note deal whether you’re holding notes for the long term cash flow or flipping notes for easy-quick cash profits! 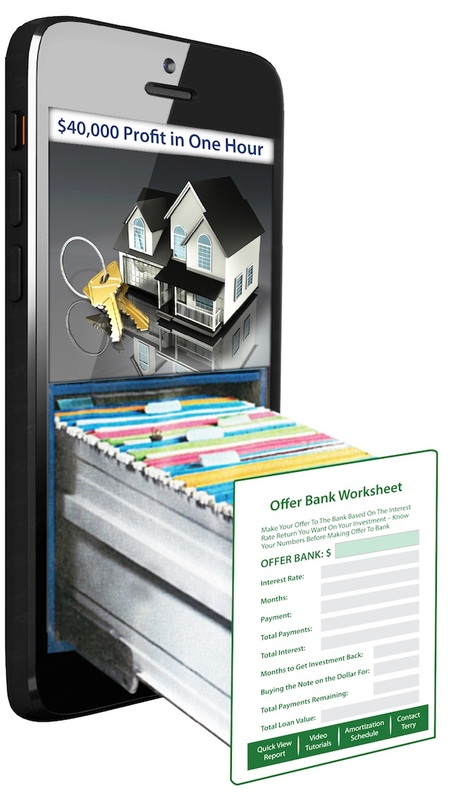 Note Buying App is a cool software tool that streamlines, manages, automates & runs your entire real estate note buying business from your iPhone! 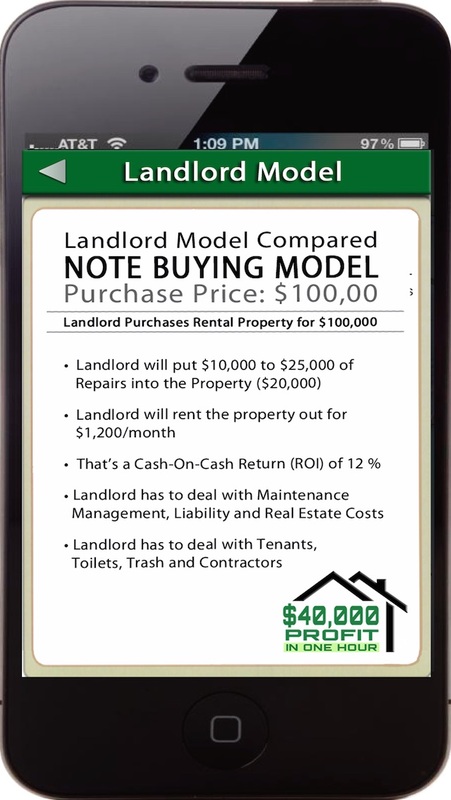 Note Buying App crunches the financial numbers, calculates the formulas, does the math & analyzes your note deals automatically for you so you'll know exactly which note deals will make you money & which note deals will not! 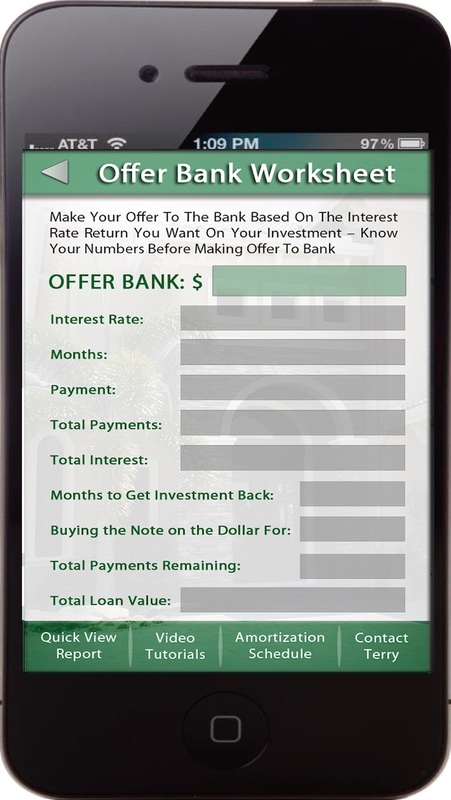 Note Buying App calculates the exact amount you should offer the bank, how much money you’ll make, what your return on investment (ROI) will be & how long it will take to get your investment back before you even buy the note! Note Buying App evaluates seven different exit strategies to find the most profitable note deals that you can turn into $40,000 or more profit checks! Note Buying App helps you build your buyers list. It creates a professional looking Quick View Report that can be emailed to your private lenders, investors and financial partners that have the capital to fund, partner & invest in your real estate deals! The #1 issue real estate investors struggle with when looking for financial partners or raising private money is credibility. With this proprietary Note Buying software, instant credibility, total respect & authority status as the go-to real estate investor is yours! Terry Bontemps “$40,000 Profit In One Hour” Note Buying App makes you look like a PRO... even if it’s your first deal and you've never made any money in real estate or you’re a seasoned professional! 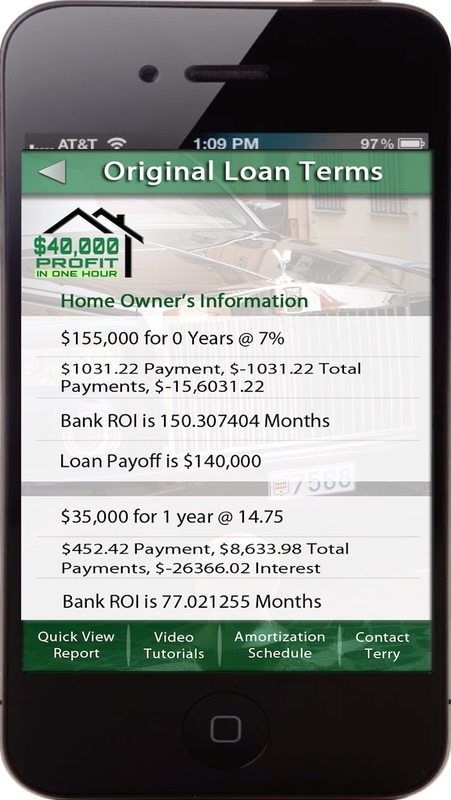 NOTE BUYING APP FEATURES: - Calculates mortgage payments for 1st & 2nd loans - Forecasts your quick cash & long term hold profits - Stores information for the homeowners property - Stores information for the banks 1st & 2nd liens - Calculates your management & holding costs, foreclosure fee's, bankruptcy costs, real estate agents commissions, repair costs, taxes, insurance, closing costs and reinstatement amount - Calculates the original loan terms, the number of payments the homeowner has remaining & how many payments that have been made on the note - Shows you how much money you will make from each of the 7 exit strategies when you buy notes - Helps you determine what the foreclosure auction bidding results will be on the court house steps - Amortization schedule calculates fixed rate loans - Quickly estimates Monthly Principle & Interest - Quickly estimates Yearly Principle & Interest - Professional Note Buying video tutorials coach you from "A to Z" thru an actual real estate note deal - Ability to email a Quick View Report of your financial numbers to your investors, business partners and private lenders directly from within the Note Buying App - Strategically calculates the best offer you can make to the bank so that you'll know exactly what your ROI (return on investment) will be to guarantee that you generate a high double-digit interest rate return on your investment If you have a support question regarding Terry's “$40,000 Profit In One Hour” Note Buying App, feel free to call him at 916-470-3869. He personally answer his own phone and he answers it 95% of the time!